Some low season advice and map of all year campsites. There are many good reasons to plan your minicamper journey in Iceland during the off-peak season. First off all, we at Iceland Mini Campers offer reduced prices on our campers after September 1st. Second, the fall season often has relatively mild temperatures (in any case, our campers come equipped with electrical heaters and blankets to keep you nice and warm). Last but not least, even though it doesn’t have any tall forests, Iceland has some really beautiful fall foliage. For the fall mini camper traveller, there are some things to keep in mind. There is an increasing number of services that are open well into winter, and even all year round. . Here is a list of campsites that are open beyond the summer season http://tjalda.is/en/winter-opening/ and map of selected open all year places. These sites have different facilities but in most cases they provide at least electricity, bathrooms and showers at a modest price. 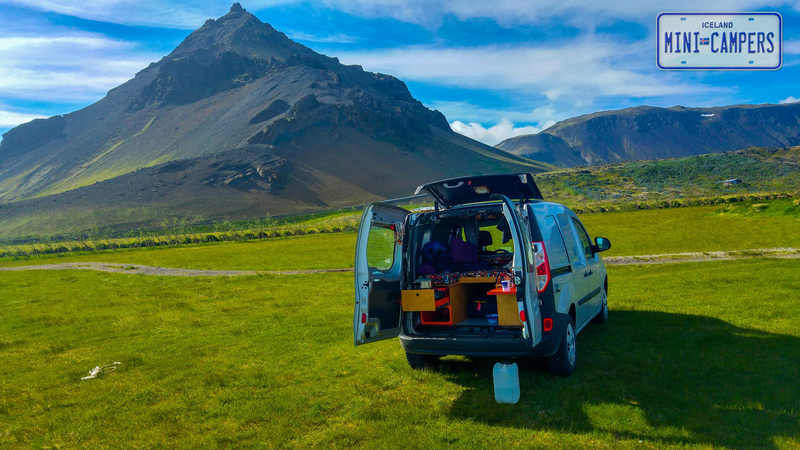 We recommend that all of our customers plan their mini camper trips around those campsites, both for comforts sake and especially since camping without permission has been made illegal in Iceland (see more info here: http://www.ferdamalastofa.is/en/moya/news/may-i-camp-anywhere). For those who want to camp at other places, all that the landowners want is to be asked permission beforehand. Swimming pools, service stations and restaurants around the country are in most cases open all year but it is sensible to plan ahead. That said, the weather can be fickle at any time during the year so we would advise visitors to keep an eye out for weather forecasts (see here: http://en.vedur.is/), bring lots of warm clothes, and dress in layers. Mini camper in the fog. Þjórsárdalur and the nicest picnic spot in the universe. Like in the previous posts, we at Iceland Mini Campers will continue describing our favorite destinations in Iceland so that you can start planning your visit. And as usual we will place an emphasis on areas that are both accessible and well suited for a mini camper visit. 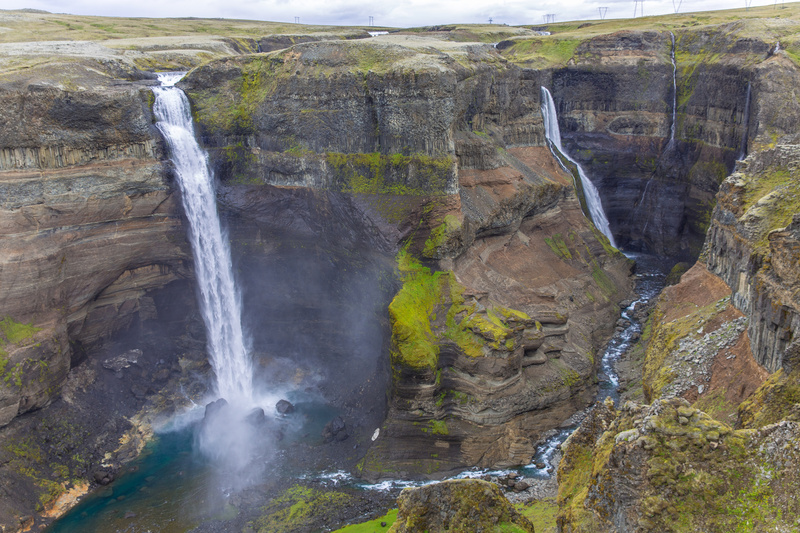 We are also interested in sharing some of Iceland’s well-kept secrets with you since it is a fact that Iceland has literally hundreds of destinations that are at least as worthy of a visit as Gullfoss, Geysir and the Blue Lagoon. Today we will talk about the beautiful Þjórsárdalur area, which has a reconstructed Viking farm, some of Iceland’s most attractive waterfalls and, in our humble opinion, the nicest picnic spot there is. Also, to make things even more exciting, Þjórsárdalur is quite close to one very picturesque volcano, Hekla, which might erupt at literally any minute now. 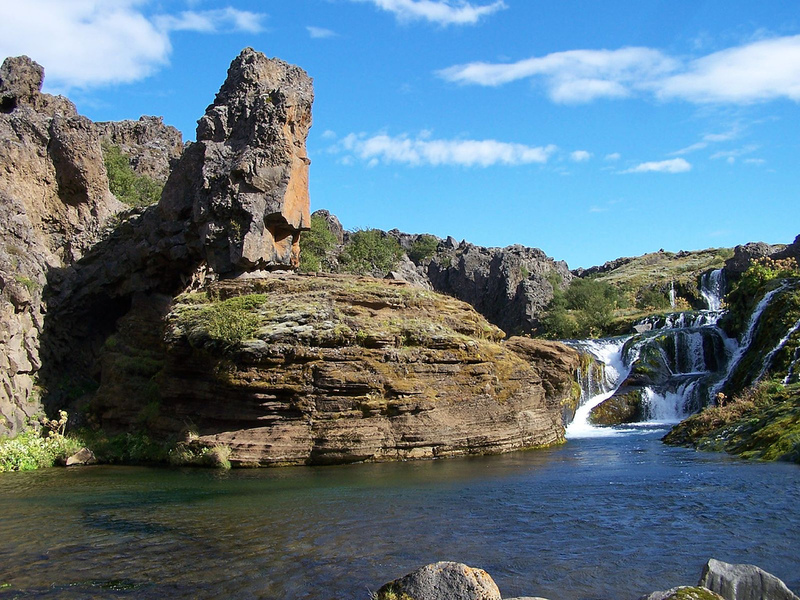 The whole Þjórsárdalur area contains a wide array of hiking trails, scenic views and interesting spots but this time we will limit ourselves to three of them. For other suggestions please refer to the Þjórsá visitor center at Árnes (see here). The Þjórsárdalur area is quite close to Reykjavík at a distance of around 130 kilometers, which amounts to a solid 90-minute drive. Most places in the area are fairly easily accessible by mini camper but once you reach the area itself there are some gravel roads so we would advise you to consider getting some extended insurance coverage if you are renting one of our motorhomes and perhaps a GPS navigator as well. The area can be reached from the ring road (highway 1) as well as via Þingvellir-Laugarvatn-Flúðir if you want to combine a visit to Þjórsárdalur with a Golden Circle Tour. Since some of the Þjórsárdalur area is quite far inland it is also advisable to plan ahead and look into the condition of roads before setting off, for instance by talking to a tourist info center or checking with The Icelandic Road and Coastal Administration at http://www.road.is/. Once you find yourself on route 32, the Þjórsárdalsvegur, you will come across a sign that points to Hjálparfoss. 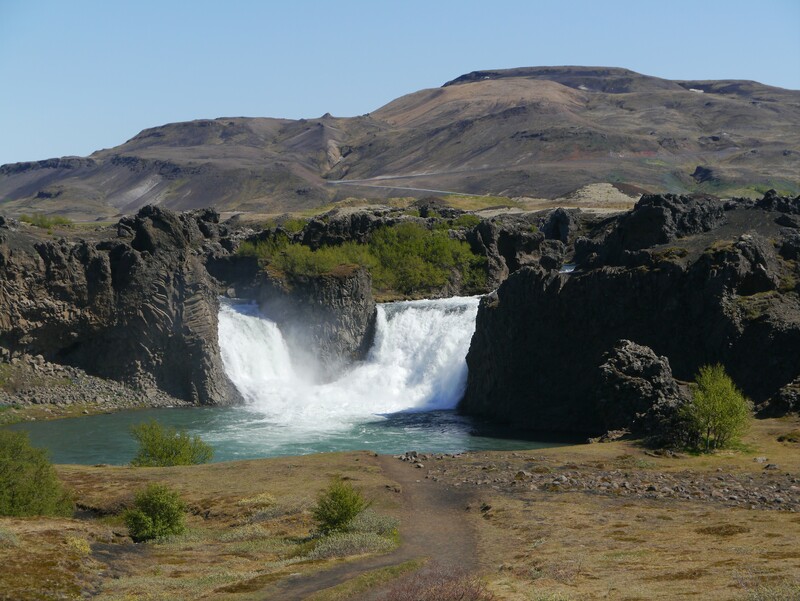 Hjálparfoss is in fact two waterfalls that combine into one, and for added effect it is framed by some very peculiar rock formations called trap-rock. 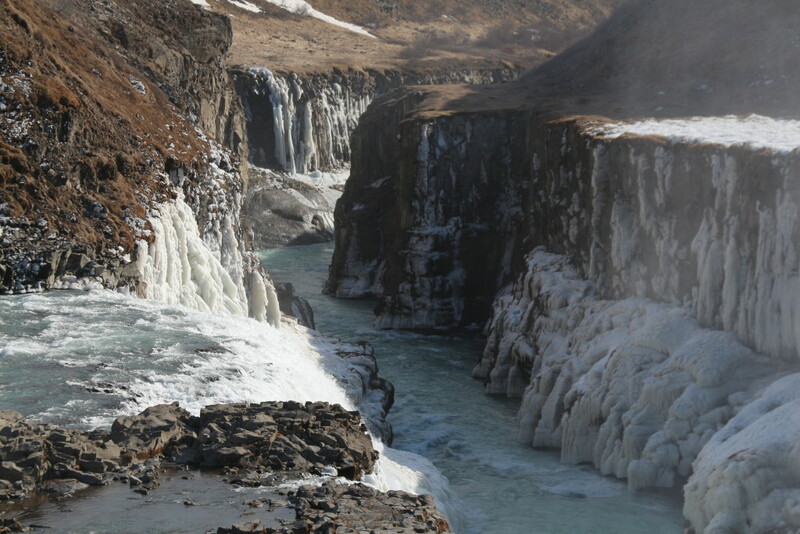 The name Hjálparfoss means waterfall of help (help is hjálp and waterfall is foss in Icelandic). Apparently the waterfall was given this name since it was a welcome stop for those traveling across the country on horseback since Hjálparfoss has clear spring water, as opposed to the foul smelling brown glacial rivers that are predominant in the area, and a nice clearing with plenty of grass for horses. 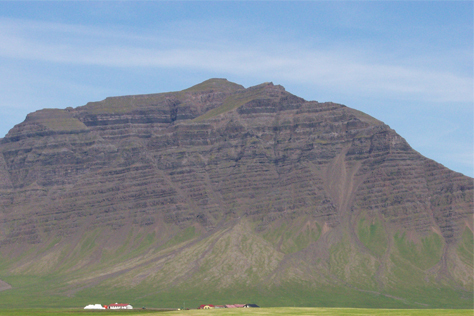 Close by Hjálparfoss on route 32, you can find route 327, Stangarvegur, which leads to the Viking farm Stöng. Stöng is a turf farm built on the excavated foundations of an older farm that was buried in lava in the year 1104, in one of Hekla’s heftiest eruptions. 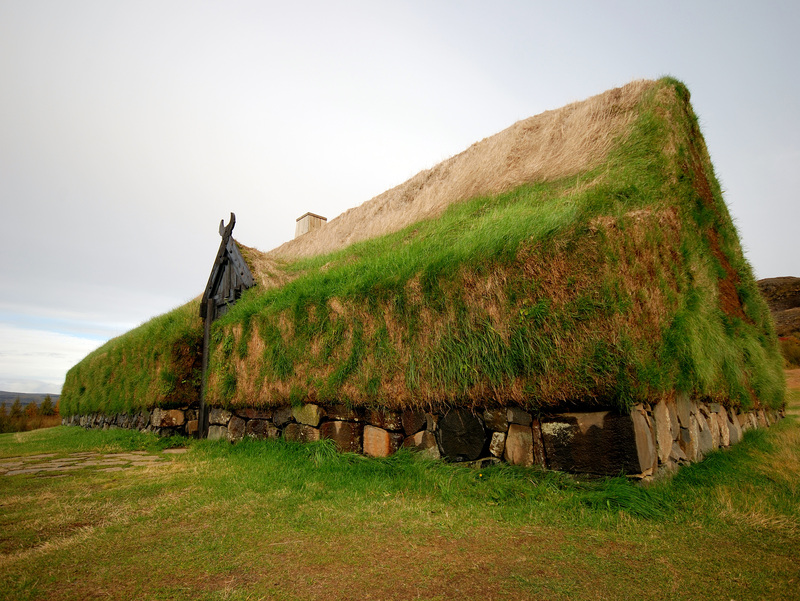 The Stöng farm offers guided tours and an exhibition of arts, crafts and the history of Gaukur Trandilsson, the former inhabitant of Stöng, about whom an Icelandic saga was written (but sadly is now lost). 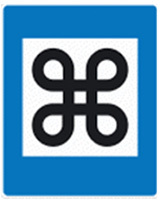 More information can be found here: http://www.thjodveldisbaer.is/en. From Stöng you can drive a short distance to Gjáin, which is quite a remarkable place. The gravel road between Stöng and Gjáin can be a little rough but in that case it is well possible to walk to Gjáin, which should take around 20 minutes. 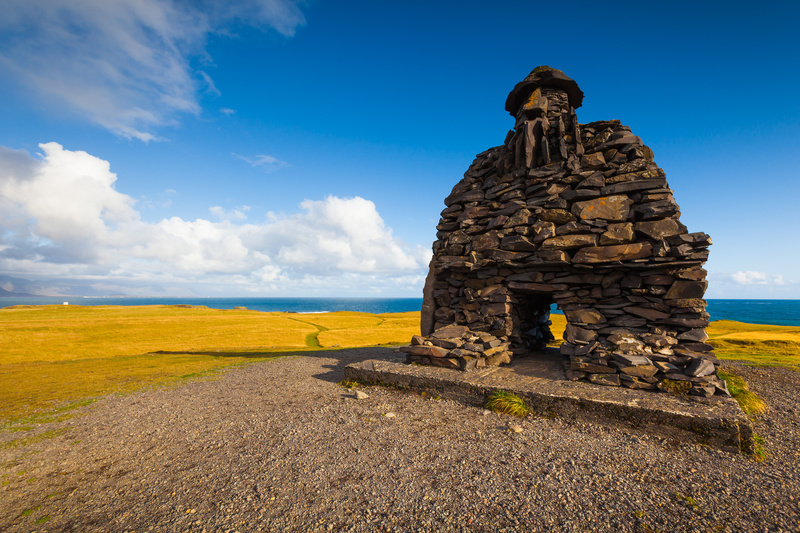 Gjáin is a small valley with green grass, a blue stream, a beautiful waterfall and strange tousled rock formations. Gjáin meets the visitor like an oasis that stands in stark contrast to the barren rocky landscapes that surround it. The calming sounds of trickling water, the scenery and the peaceful air of Gjáin makes it, again in our humble opinion, the best picnic spot in the universe for the travel weary mini camper driver. It should also come in handy that our campers come furnished with a gas heater and all the equipment you need to make hot chocolate, which is the perfect drink for your picnic at Gjáin. For an overnight stay in the area we recommend the camping grounds at Sandártunga, Árnes or Brautarholt. There are also farms in the area that offer horseback riding and assorted services and activities. The general area also has several bars, café’s, restaurants and, of course, a few swimming pools. So our advice is the same as usual. Drive slowly and safely, make many stops, and enjoy. The Golden Circle tour, with its mandatory stops at Þingvellir, Gullfoss waterfall and the Geysir hot spring area, is by far the most popular excursion for anyone visiting Iceland. These destinations are only a little over an hour’s drive away from Reykjavík and therefore make for the perfect short sightseeing tour. As a result, theses places tend to get a bit too crowded and a bit too “tourist-y” if you will. 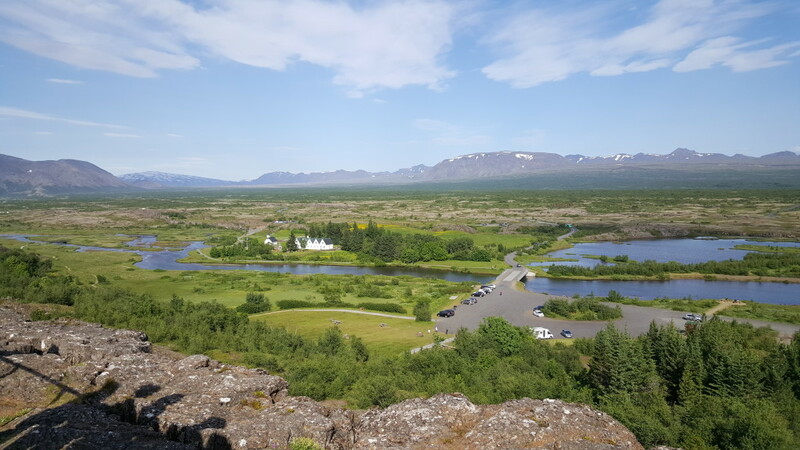 However, in the general area around Þingvellir, Gullfoss and Geysir there are many other very interesting places to visit that are fortunately mostly overlooked by the big bus companies. 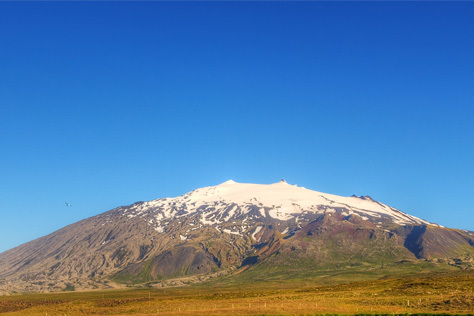 So without further ado, Iceland Mini Campers-our motorhome rental company-proudly presents The Golden Circle Alternative Stops, with or without the more mainstream stops. When heading from Reykjavík it is best to take the highway 1 main road straight out of Reykjavík and through the neighboring village of Mosfellsbær, then take a right turn at highway 36 or Þingvallavegur (all these roads should be clearly marked but for better information such as roadmaps, distances and gasoline costs etc., refer to the websites vegvisir.is, vegagerdin.is and vegasja.vegagerdin.is). Highway 36 takes you straight through the Þingvellir national park and has some beautiful scenery along the way such as lake Þingvallavatn and the surrounding mountains. After passing through the Þingvellir area you should take a left at highway 365. 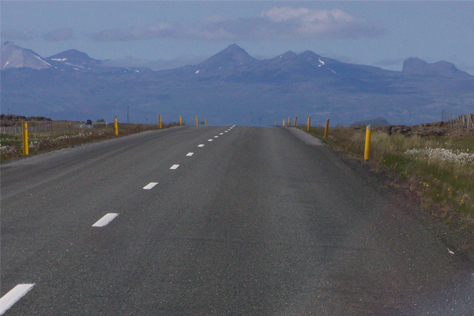 If you stay on this road you will see a sign pointing left towards the Laugarvatnshellar caves. These are two sandstone caves that were people used to live until 1922. Interestingly enough, the last people who lived there had two children while living in the caves, one of whom is alive and well and reportedly has her own Facebook page. That in itself says a lot about the fast development of Iceland in the past century or so: being born in a cave and being on Facebook can happen within the space of a single lifetime. After Laugarvatnshellar take a left at highway 37 which takes you the small village of Laugarvatn. There you can find a swimming pool, some shops with local design and produce and a couple of restaurants. If you proceed towards Geysir there are a number of interesting places in the surrounding area. First of all is the farm Efstidalur, which is on the left hand side 15 minutes after passing Laugarvatn village. This cow farm has set up a restaurant on top of its barn and makes delicious ice-cream (more info here). 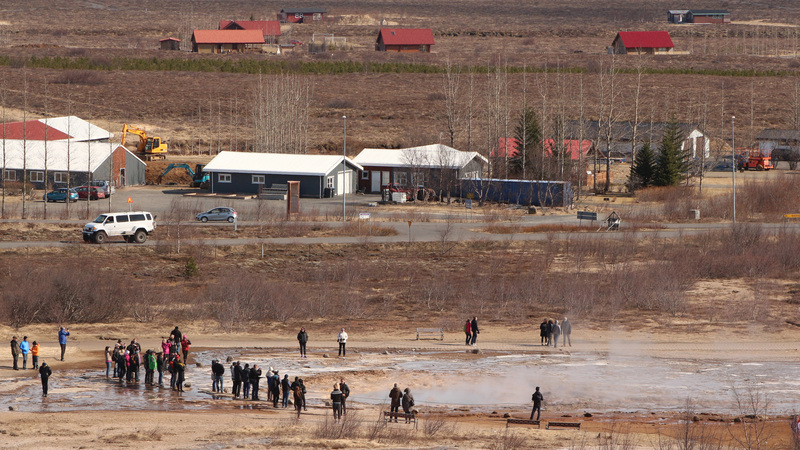 Strokkur Geysir – Waiting for the eruption. Further down highway 35 (highway 37 changes to 35 between Laugarvatn and Geysir) you will reach the Geysir hot spring area. A little further on the left hand you find Haukadalsskógur, a beautiful forest with many marked hiking paths of various distances and a facility for barbecuing. 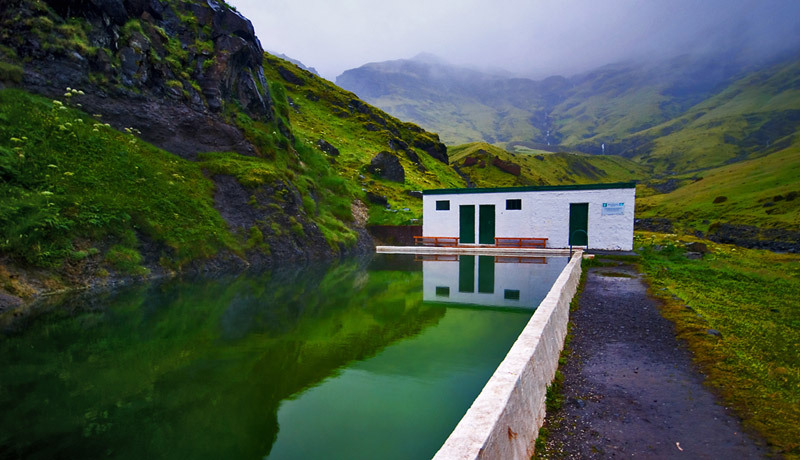 If you continue on highway 35 (past the road to Gullfoss) you will end up in the small village of Reykholt, which has an excellent swimming pool with a waterslide and hot pots. In this general area there are many greenhouses that produce a wide range of vegetables and berries. Often these are sold in little boxes by the roadside. Some greenhouses welcome visitors such as the tomato growers at Friðheimar, which offer delicious tomato soup and a wide range of juices, jams and sauces made from tomatoes. Nearby you can also find the waterfall Faxi which has camping facilities right next to it (information and coordinates here). Gulfoss in the winter time. 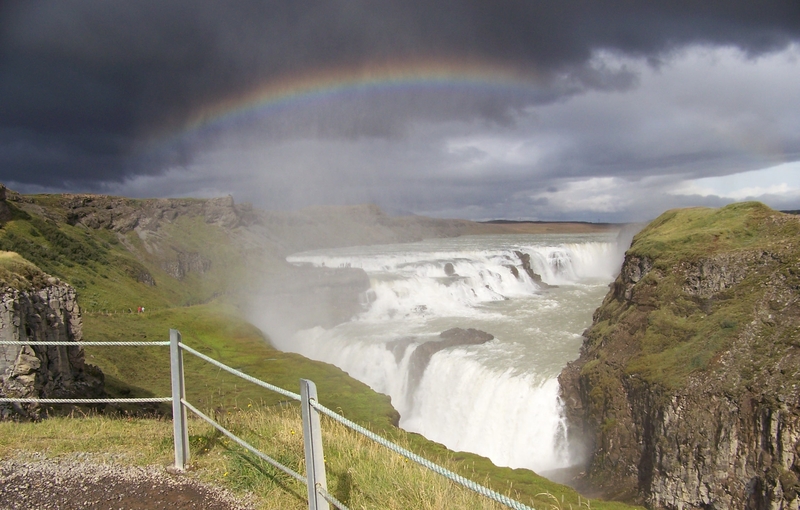 Gulfoss waterfall and a rainbow in the summer time. The closest village to Reykholt is Flúðir which has a grocery store and a very good Ethiopian restaurant, called Minilik. 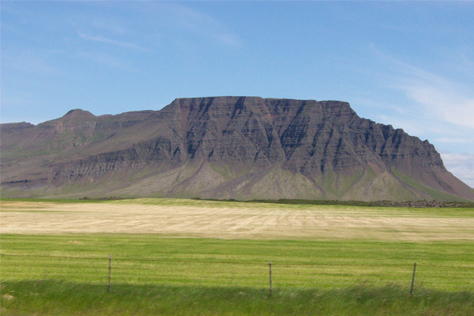 To finish the Golden Circle, people typically drive through the Grímsnes and stop at the picturesque Kerið crater (see here) and to the small town of Selfoss and from there back to Reykjavík via highway 1. 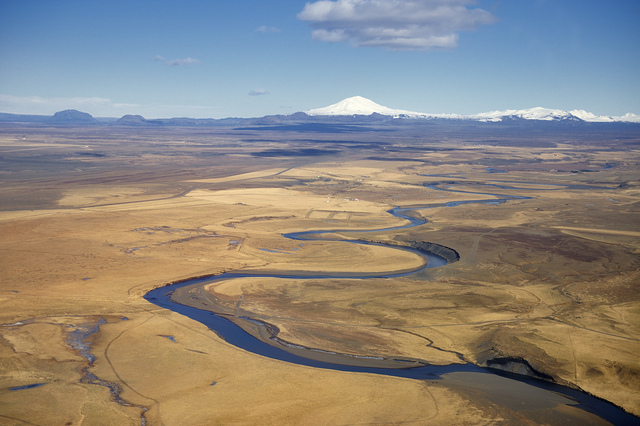 The route from Selfoss to Reykjavík takes circa 45 minutes and offers a view of mossy lava fields and other strange landscapes. Along these places mentioned above there is a wide selection of places to camp, with or without service (these can be explored better here). To conclude, this general area offers great many locations, shops and stops not mentioned here above so our advice is to drive slowly, have plenty of time and make discoveries on your own.